Can you play casino games on Facebook? 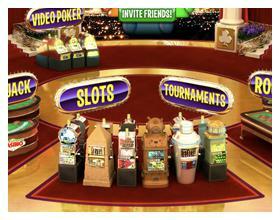 Yes, you can play casino games on Facebook, just not for money. Some of the casino games are really fun to play, and are a great tool for getting to know how each game works and the rules. However, in some games (where you’re playing against other Facebook users) it doesn’t offer you a fair reflection of what these games will be like playing for real money. One perfect example of this is Zynga Poker, you could say it’s great because it offers what seemingly is a limitless amount of players and is really fun to play, but it’s very important to remember they offer everyone free chips and because of that you’re going to get some really bad play – you might play on Zynga and be amazing because of this, but step into a real money situation on somewhere like Full Tilt Poker and you’ll be eaten alive because when there’s real money involved and no free chips – not many people are going to give you stupid calls or rises just for fun. If you’re looking for a more real experience of how games may work in Las Vegas, look no further than Palace of Chance Casino – from slots to roulette to blackjack, you’ll get to experience all these games along with bonuses and free chips which are available to start playing and trying the games, once you feel confident and ready, you can go ahead and move to a real money account. This is a more “real” experience because you’ll be playing against the computer rather than other people, so you’ll see what it’s really like in a casino, and with over 1.5 million users, it’s hard to find a better casino game on Facebook. It’s also worth mentioning Lucky Gem Casino, developed by EA sports – it’s great if you like slots, but they even have board games like Monopoly and if that’s your thing it’s well worth checking out.